Got a highly touted prospect in the minors, and you want to show the world you're a fan? You could wear his jersey. 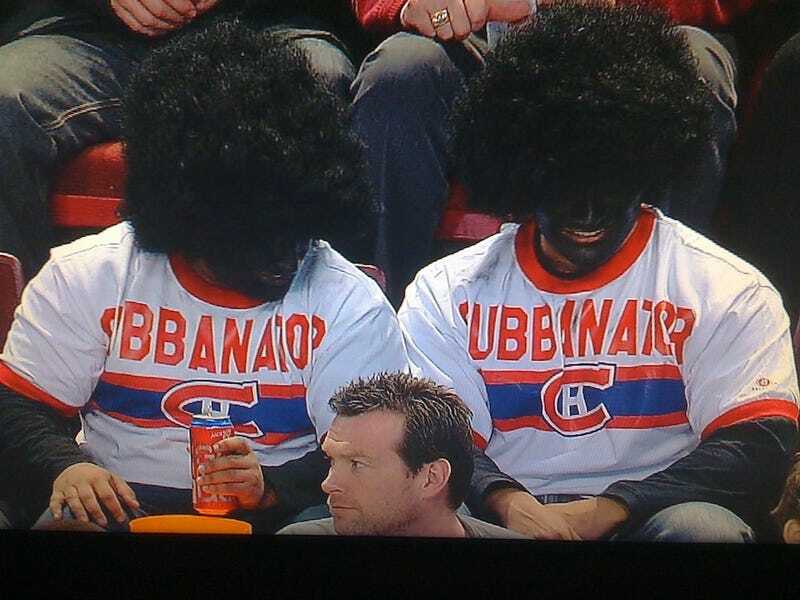 Or, if you're in Quebec, you could break out the shoe polish and afro wigs. P.K. Subban was a second round pick for the Canadiens, and is playing his first season with the AHL Hamilton Bulldogs. It's likely he'll get called up for good this season or next, and Habs fans are excited. Oh, and he's Jamaican Canadian. And doesn't have an afro, in case you were wondering. As reader Nate, who sent in this pic puts it, we should reserve our scorn not for the two fans, dumbasses they may be. But rather for the RDS cameraman and producer, who decided to put them on camera for close to ten seconds at last night's game. Maybe it shouldn't be surprising that this happened in Montreal. There's a history there that goes back to the racism faced by Herb Carnegie, the first black Canadian to be offered an NHL contract. Even in this day and age, Kevin Weekes had a banana thrown at him at the Bell Centre. So let's not dismiss backwards racist fans as a purely European product; we've got similar problems in our own backyard.